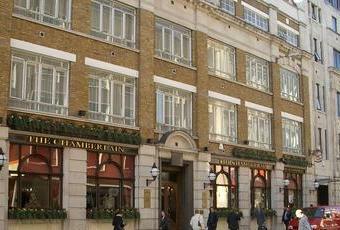 This a fairly nice hotel with a pub selling Fullers ales. On this occasion, it was Two Halves, Seafarers, London Pride, ESB & Summer Ale. Aspalls is the cider. Has a few tables and plenty of standing space for when they are all occupied. Plenty of staff to provide a quick service and not the most expensive City pub I have been in. A great place to meet after work. Spacious, lots of seats. Good choice of beer, fast service. Mostly for the middle aged, city workers, but nothing wrong with that. Food also excellent. Slightly pricey though. Popped in on a quiet Sunday. The bar is part of the Chamberlain Hotel and close to the Tower of London but apart from almost being empty, it was fine. Excellent Fullers London Pride. Comfy leather bench seats would prove a little embarassing for women to climb down off. Beer fine but the place lacks any real atmosphere. As the previous review aptly put it - "no reason to return". Far to hotel bar like, drinkable pint but no reason to return.